Workers at Teachout Library rooftop observatory, Hiram, Ohio, c. 1900. 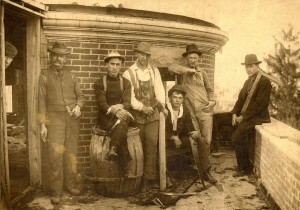 Photo courtesy Stephens Memorial Observatory and Hiram College Archives. I’ve been slowly updating my public programs page. Just the idea of adding all the available viewing opportunities in California exhausts me, so I keep skipping that state to focus on observatories closer to home. Today, as I was digging through the links and thinking about a road trip, I came across a set of photos showing the construction of the Teachout Library and Observatory in Hiram, Ohio (replaced in 1939 by the Stephens Memorial Observatory). I like the above photo for a couple of reasons. First, it would seem that the photographer assigned a random tool to everyone, just in case his audience wouldn’t understand these men were involved in the building trades. We can see, from right to left: a carpenter square; something I’m not sure about but could be a flat construction pencil; a handsaw; a hatchet; a pick; and a hammer. The guy with the hammer is also holding an unknown object, possibly another hammer or a scribe. The only worker not holding a tool is the one at the far left of the photo. That’s the second reason I like this photo. What’s that guy doing, peeking around the door jamb like that? For more historic photos of the Teachout Library and Observatory, including a few of the 1939 fire that damaged the building but not the Warner and Swasey telescope inside, click the photo below. 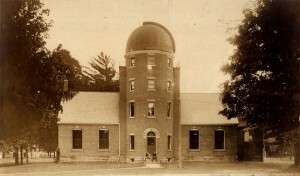 Teachout Library and Observatory, c. 1900. Photo courtesy Stephens Memorial Observatory and Cary Bacher.